Well, these are finally shipping out and some of you may have been lucky enough to get them before Christmas. A fairly sharp looking figure, to say the least. And when they said METAL, man they weren't kidding. The inside body frame is die-cast metal, as well. Is it me, or do the Japanese really like to put stuff together. 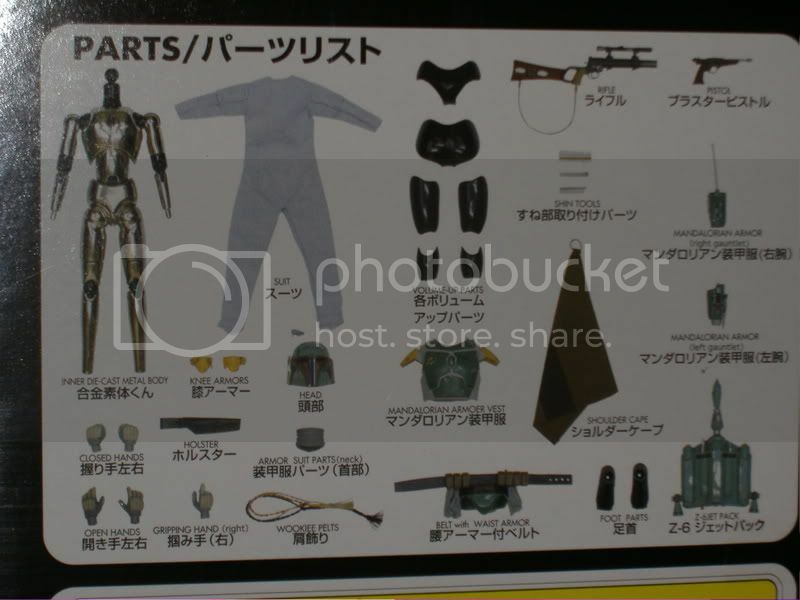 The Marmit figures and the Kotobukiya models were in pieces like this. Of course, the Kotobukiya stuff ARE models, so they're actually supposed to be put together, but you get what I saying. Definitely going to have to play dress up with this figure, before you can display him. How did you aquire that and how much????? Sadriel has connections. Connections which us mortals lack. I picked mine up from www.starwarsshop.com @ $99 each plus shipping. They should still be available, and is the easiest place to pick one up. I'll be covering this figure more in my next "Roundup", but putting this figure together reminded me of how much I hated putting together the Marmit figure. Overall, it's a nice looking figure with the exception of the legs... they just look odd (you can see in the pictures). The connections for the hands and feet are not very "tight" and the immense weight of the metal figure will normally cause the figure to fall over as the feet just give way. As with the Marmit figure the extra items like the knee guards and rocket pack are just held in place by their own plastic shape and are prone to falling off. If you've just got to get everything Fett related (like me) then go for it for $99 from starwarsshop.com otherwise, save your pennies for the 12" RAH Boba Fett if you can still find one. Dude, I had that same problem with the Marmit figure. Everything went together fairly well, but the hands still keep popping off. That's the one thing I like about the Boba Fett RAH figure. The way they fixed the hands problem. 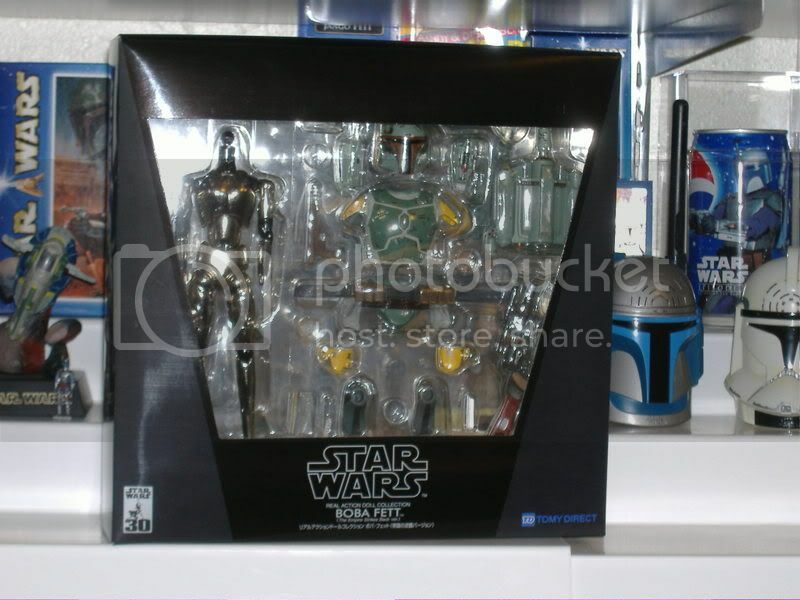 Have you gotten the Jango Fett RAH figure yet? That one looks really well done. And the helmet is actually more proportional than the Boba RAH figure. The only problem is getting the helmet on his head. It doesn't fit very well, so I ended up just leaving it off and posing him with it under his arm. If you force it on his head you can pose the helmet to where it looks normal, but if you place it on a high shelf, you can see his chin sticking out under the bottom of his helmet at a weird angle. It's like the head is leaning forward inside the helmet because it doesn't fit quite right. They still have the same stand as the Boba Fett RAH figure. So, it doesn't fit quite right either because the rocket pack gets in the way, so I just used one of those generic 12" figure stands. Other than that, though, I was really pleased with it. Very sharp looking. Where can I get a good deal on a Boba Fett RAH figure? That's the only place I've seen it being sold at. Of course, that's the first place I saw it for sale, so that's where I pre-ordered it from. I thought the $99 one was this new Japanese one, he said that if you wanted a better one then save up for an RAH figure. Aren't they different? Have you gotten the Jango Fett RAH figure yet? That one looks really well done. 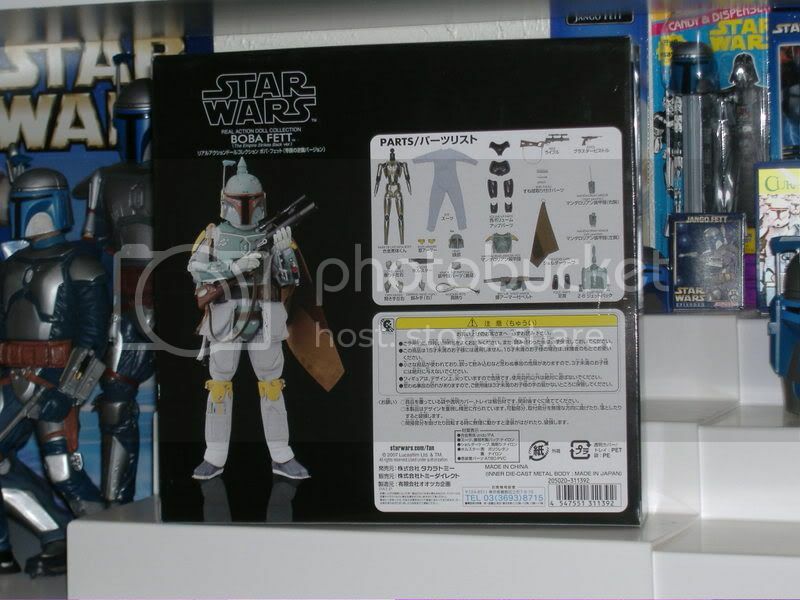 I agree, the Jango RAH does look very impressive, but my Fett collection is limited to just Boba... I spend enough on him without also getting Jango too! The best place to get the RAH WAS through Sideshow Collectables, but your best places now are from reputable online dealers and if all else fails they are readily available on ebay depending on how much $$$ you are willing to spend. Is it still available, or is it one of those 'limited supply' thingies? No, they're two separate figures. The die-cast metal one is much smaller than the RAH figure, and a bit cheaper. Well, these are finally shipping out and some of you may have been lucky enough to get them before Christmas. A fairly sharp looking figure, to say the least. And when they said METAL, man they weren't kidding. The inside body frame is die-cast metal, as well. Is it me, or do the Japanese really like to put stuff together. The Marmit figures and the Kotobukiya models were in pieces like this. Of course, the Kotobukiya stuff ARE models, so they're actually supposed to be put together, but you get what I saying. Definitely going to have to play dress up with this figure, before you can display him. Its not about the putting together its the Lisence that they have purchased. ya see it all the time in all product lines.. change 1 line in the contract and you can do something similar and Lucas have more bucks in their pocket and we have to but more ! Man I picked mine up form Toys 'r' us! They had the Vader one there too! But the thing is, I don't understand why you take them out of the box?????? That's just not cricket! How much was it Peter ?? Any chance you could pick me one up and send it ? Paypal ? It cost me 11000 yen, and I got the last one that was not the display, but next time I go I will see if they have got more. Where are you? im in the UK... anything you are after ? Same. I also live in the UK. The Boba figure kicks A**! Nah mate all good, unless u know where to get Toydolls albums on vinyl? which are you after ? I've not bought a larger high quality Fett figure yet. I'm waiting on Diamond Select. They should have fairly good quality, and their price is super. I actually have all of them I am trying to find some for a mate in Australia, I am more of an ipod kid!